Emmerson Mnangagwa was sworn in as Zimbabwe's president on Friday, marking the final chapter of a political drama that toppled his predecessor Robert Mugabe after a military takeover. Mnangagwa, until recently one of Mugabe's closest allies, took the oath of office at the national sports stadium on the outskirts of Harare to an explosion of cheering from the full-to-capacity crowd. 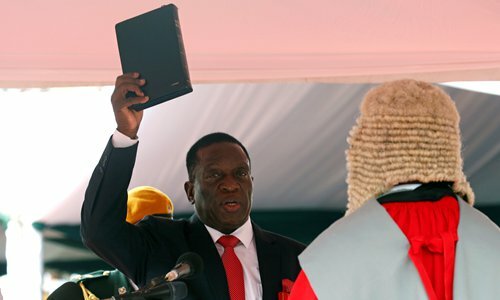 "I Emmerson Dambudzo Mnangagwa swear that as the president of the republic of Zimbabwe I will be faithful to Zimbabwe and obey, uphold and defend the constitution and all other laws of Zimbabwe," he said as he took the oath of office before the chief justice. He then received the chain and sash of office, and took salutes and pledges of allegiance from the country's military and security chiefs. Mnangagwa vowed during his inauguration speech to fix the economy and battle corruption. "Acts of corruption must stop forthwith. Where these occur, swift justice must be served," he told a crowd of tens of thousands at his inauguration ceremony, promising to "create jobs for our youth and reduce poverty for all." Mnangagwa, 75, had said this week that Zimbabweans were witnessing "a new and unfolding full democracy," although critics say he is a hardliner in the ruling ZANU-PF who gained power in a de facto military coup. "We are excited and expecting a lot from Mnangagwa. We have been under a dictatorship for a very long time," 23-year-old Sharon Mauyakufa said. Mugabe, who ruled the southern African country for 37 autocratic years, was ousted when the military intervened after he had sacked Mnangagwa as vice president on November 6. A group of elderly women dressed in blue and white gyrated in time to a big band to wild applause from the crowds ahead of the swearing in. Snipers had taken up positions around the stadium amid tight security as jubilant Mnangagwa supporters streamed in, many dancing as music played. State-run media had earlier claimed that Mugabe may even attend his successor's swearing-in - but later suggested that after he and Mnangagwa talked about the inauguration, he agreed he "needed time to rest." Mnangagwa also "assured him and his family maximum security and welfare" for their future as private citizens, the state-run Herald news site also reported.